6PK1345 Belt. Heavy Duty Automotive Serpentine belt. Replaces Gates K060529, Jobber 530K6. Home > Automotive Belts > Automotive Serpentine Belts. PK, K Section Poly V > 6PK1345 Belt. Heavy Duty Automotive Serpentine belt. Replaces Gates K060529, Jobber 530K6. 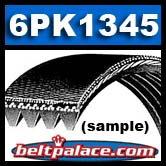 6PK1345 Belt. Heavy Duty Automotive Serpentine belt.